Coming at ya in the space-time continuum around star date 6MAY2016, the prog + thrash = tech thrash Arizona based VEKTOR burst onto the scene back in 2009 with their attention getting album "Black Future," overcame any possible sophomore slumps with 2011's "Outer Isolation" and have successfully accelerated their tech thrash vessel into yet another sector of their bi-propellant yet harmonious blackened thrash metal world of Voivod influenced sci-fi adventures. The band deliver yet another competent display of musical maestrohood with their third release TERMINAL REDUX. While experiencing cislunar events along the way with forward light scattering, these brave individuals rejected all temptation to water their music down in any possible way and instead opted to experience simulated free-fall through fusion-fuel cell technology to deliver a fresh new trajectory of thrash metal for all to enjoy like an inferior conjunction of the near perfect syzygy of heavenly bodies, all the while exhibiting an ultrahigh frequency of their metal sci-fi adventures into the Van Allen radiation belts and beyond. BTW this was the first album released on Earache Records. Big step up, guys! Right off the bat, "Charging The Void" slowly oozes into the listener's conscious with a short ambient clip before bursting out into full tech thrash fury appeasing any potential fears of "selling-out" as often occurs when a band like VEKTOR becomes quite revered and climbs up the metal ranks in a short time. No way! VEKTOR not only deliver the expected thrash metal hooks from the past bringing the classics of the late 80s / early 90s continuum to mind but more than up the ante in the most logical (Mr Spock would approve) and volcanistic ways but incrementally brings VEKTOR into a more sophisticated realm of the metal universe bringing them ever closer to zero lift trajectory, the most coveted position in the metal world where all a band must do is release an album and metal heads far and wide go absolutely bonkers over its mere existence. TERMINAL REDUX elevates the band into a yet more sophisticated stratum of metal madness. This album is a logical but NECESSARY extension of the VEKTOR continuum! 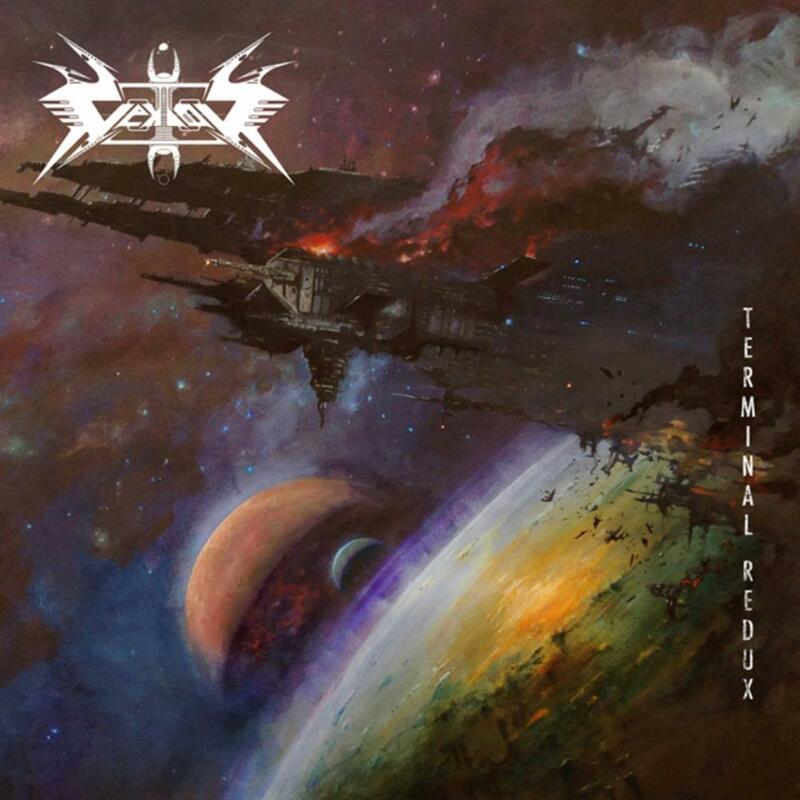 While the thrash elements that are on board inspired by Voivod, Megadeth and other past masters are in full regalia on TERMINAL REDUX, there are a plethora of additional elements that elevate VEKTOR's prog creds manyfold. There are more bluesy riffs that add an extra layer of catchiness (important in prog metal as experimentalism can quickly spire out of control and veer off into the void where only the most dedicated will follow), but also more subtle elements such as female vocals (although none are given and i wonder if there's some falsetto or OMG even hidden castrato elements going on here! On with the codpiece only clad iron!) As the album goes on i'm a little dismayed. Hmmm. I really want to give this album a seal of masterpiece approval but i really just can't. It starts out really promising but then becomes a little monotonous in its delivery. Yes, every single track is a beautiful composition and all but the problem resides in the fact that they all start sounding too similar to one another and at a staggering length of 73:21 it is apparent for the prog metal enthusiast that this album needed to be trimmed down a bit to fulfill its entertainment value. While tracks like "Collapse" which deliver clean vocals and a subdued VEKTOR approach that allows a break from the frenetic tech thrash approach, it just ends up being too long of an album for the amount of effort put in. Simple as that. Yes, one of the most surprisingly discoveries on the album is at the end of the 10th track "Recharging The Void" with its tech thrash pummeling approach throughout the first when it totally turns into a non-metal soul track and actually delves into Pink Floyd territory which has become the popular thing to do as they remain one of the most popular bands in history. It ends with clean guitars, clean male vocals and a female in the background going "ooooo ooooo aaaaah aaaah." It does go back into metal territory but ultimately TERMINAL REDUX seems a little too calculated than divinely influenced. A great listening experience but not one that i could call a masterpiece. Thie trajectory of this band's albums though gives me very high hopes that they are indeed on the way UP and not just a flash in the pan. TERMINAL REDUX is very much recommended if not the epitome of perfection.